So begins the description of the iTunes version of Desert Bus, a minigame which originated on Sega and the PC within the world of Penn & Teller’s Smoke and Mirrors and which has been hailed by some, including The New Yorker, as “the very worst video game ever created.” It is a testament to futility, yet one which allows for the possibility, however minimal and cockamamie, of victory. Drive the distance from Tucson to Las Vegas, in painstaking real time and with the bus constantly swerving just so to the right, and be rewarded with a single, solitary point. The game cannot be paused. The metaphor you likely saw coming: LeBron James is the driver of this bus. Each game of these Finals is likely to be his own, personal trek to Las Vegas on behalf of a nation that unwittingly bought a ticket. We’re all aboard for the rubber match of a rivalry that is set to define this revolutionary half-decade of NBA basketball, a handful of years which will determine the course of the league, and its game, for a long while. But first, of course, must come the unmanageable task of the series itself. The question is nearly rhetorical at this point, if not for last year: how can the Cavaliers possibly stop this juggernaut of a team, this impossible fantasy lineup assembled in real life, under real cap concerns? Golden State predictably produced another all-time great regular season team, one which led the league in Offensive Rating, Pace, margin of victory and True Shooting Percentage while also being second in Defensive Rating. A 73-win team adding an all-time great in Kevin Durant and then charging to 67 wins is perhaps the worst of all possible outcomes. Even Durant’s injury in the second half of the season did nothing to slow Golden State’s overwhelming makeup; if anything, it just shed a light back on Steph Curry – remember him? Two-time defending league MVP? – who averaged 26.7 points, 7.6 assists and 4.8 rebounds on 47.2% shooting and 42.9% from three in the games after Durant went down on February 28. It may not surprise you that the Warriors have shot the fourth-highest percentage of threes of any playoff team thus far; it may surprise you that they have shot the fourth-worst. Depending on what you want to believe, the Warriors are either playing the best basketball of their season, or they have yet to fully evolve into their most terrifying form. Cleveland, meanwhile, sleptwalked through the regular season, filing a term paper featuring the fourth-best offense in the league in terms of points combined with the twentieth-best defense in points allowed. The offensive and defensive ratings were fit to match, at third and twenty-first, respectively, on their way to the two-seed. Tyronn Lue’s Cavaliers were not a willing or able sparring partner for the Warriors on April 12th. Yet, since the playoffs began, a few things have changed to inspire confidence in the long-suffering, and short-enjoying, faithful: the Cavaliers have shot better than anyone, including the Warriors, from the field and from three. Ever the solider, as documented in his Zach Lowe profile, Tristan Thompson’s offensive rebounding percentage is up almost three points from the regular season. Kevin Love’s three-point percentage is up over ten points from his regular season average, and he may be playing the best all-around basketball of his career. That doesn’t even broach Kyrie Irving’s career-making Game 4, which was a 42-point, 4-assist, 3-rebound performance that saved the Cavs from undue pressure with LeBron in foul trouble. After hitting the series-clinching three last year in Game 7 against the Warriors, and at age 25, Irving really doesn’t have anything to prove; that he continues to develop into the player so many hoped he would be following his injury-riddled season at Duke inspires fans, likely to the chagrin of the Warriors. The 2012 NBA Finals featured an Oklahoma City Thunder team, unfortunately ahead of a time that would never truly arrive for them. 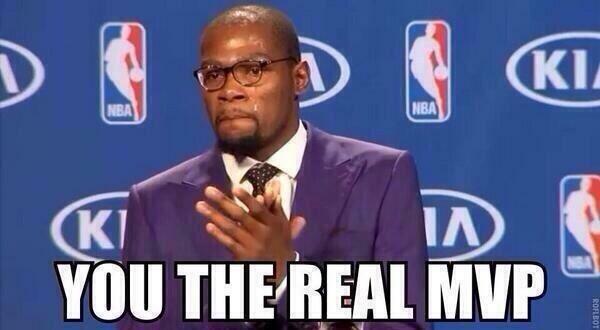 Durant, of course, was a key member of that team, and this is his second trip to the Finals. He figures to secure a ring now, with more to come. The world is his. Durant’s problem is the same one he would’ve faced regardless of his departure: LeBron James remains the best basketball player in the world, and he has an essentially hand-picked team surrounding him. Durant’s problem is exactly what LeBron’s isn’t: James knows how to best utilize the tools at his disposal, while Durant will likely be left to take advantage of the shots allocated him. Which, make no mistake – they’re great shots, until Steph Curry starts calling isolations, or Klay Thompson starts firing from the team logo at centercourt, or Andre Iguodala starts to prove his monetary worth, or Draymond Green decides that fouls are simply the price of doing business with the Warriors. Beating this edition of the Golden State Warriors isn’t impossible, and everything in the final sentence of the preceding paragraph borders on pipe dreams. The popular “Warriors in six” pick is popular for a reason, and even seven may put out the result many expected a year ago, yielding Kevin Durant crying in The Real MVP’s arms with his impossibly long limbs encompassing the Larry O’Brien Trophy. And if it is, so be it. But if anyone is up to the challenge, it is a suddenly 32-year-old yet still ageless LeBron James. A narrow miss on the top three of the MVP ballot this year, LeBron is playing like he’s never heard of the other three. Being that he’s in the Eastern Conference, and that he only consistently visits the West in early June, that may be at least partially true. LeBron’s throne isn’t up for debate. While his crown may be, it’ll take a Herculean wrangling to borrow it, even if only for a summer. 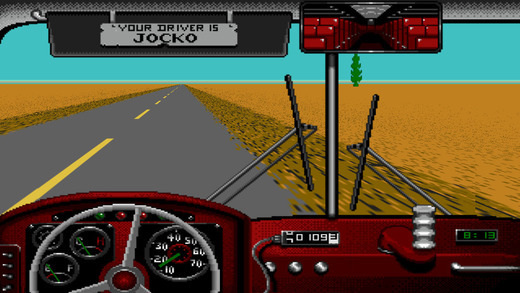 Penn & Teller designed Desert Bus as a direct response to Janet Reno’s comments regarding the moral panic surrounding video games and the violence therein at the time of its release, in 1995. Doom was the culprit in that case; Grand Theft Auto was still two years away from its initial iteration. Similarly, Michael Jordan’s Bulls lost for the only time during their ‘90s run in 1995 and had yet to reach their full-on, powerhouse form. These Finals must be LeBron’s rebuke to a Golden State Warriors team for which the Collective Bargaining Agreement and the influx of TV money, which spurred along the salary cap boom last summer, allowed. It was certainly Kevin Durant’s right to sign with the Warriors, just as it was Penn & Teller’s right to create Desert Bus. Just the same, it is LeBron’s right to drive that distance, in real time, to defeat it, however many times he must. J.R. Smith and the actual, real-life implications of Las Vegas notwithstanding; by the way, the game now acts as a charity vessel, with teams competing to post the highest score on behalf of Child’s Play. Like J.R., the game is ridiculous, but it now has a distinct function and equitable societal contribution. All of this, courtesy of the wise hive minds at basketball-reference.com. The Rockets, of course, were in the lead. The Cavaliers happen to lead this one, while being second in the preceding stat.